In Example 1A, notice the ascending chromatic melody leading into the climactic moment of the passage (mm.7-8) with an Ab-Gb appoggiatura. This climax is followed by a sequence of mini chromatic ascensions which may be thought of as “aftershocks” after the main climax. The sequence is descending, of course. Then an interesting thing happens. The same chord re-emerges four times, each time “resolving” to a different sonority. The A fully-diminished chord appears to be a viio7/V, right? However, in the first three occasions, the chord does not behave as such. Notice what happens. In each case, different chord members of the apparent viio7/V resolve down by half step into the chords that follow. In measures 6-7, the A and C resolve down to Ab and Cb respectively, creating a viio7/V?—iv progression. In measures 8-9, the A, Eb and Gb resolve down to Ab, D-natural and F, creating a viio7/V?—viio progression. In the third case in measure 10, the A and Gb move to Ab and F while the Eb moves down by whole step to Db, creating a viio7?—VII progression. Only in the final instance in m.11 can the “apparent” label to our chord be shed since we arrive at a dominant chord on beat 3 of the measure. However, the “proper” resolution does not take place without some alteration first. Rachmaninoff withholds the C-natural that appeared in each of the previous instances of our “viio/V?” chord and introduces a Cb in beat 2 instead, thereby transforming the viio7/V which the listener has grown accustomed to into a German augmented-sixth chord. Interestingly, the added Cb allows for an extra chromatic descent in the resolution of the chromaticized predominant sonority. Not only is the Eb moving to D-natural and the A-natural sliding down to provide the Ab seventh of the V7, the Bb is arrived at from the Cb above. It’s as if the viio7/V couldn’t achieve a “proper” resolution (after three attempts) without the assistance of an additional chromatic descent. In this final case, the Gb is also held through and becomes a 6th substituted for the fifth of the chord. This provides a Me-Do (Gb-Eb) resolution that imitates the Bb-Gb melodic motion into measure 4. If furthermore provides the outlined full outlined tonic triad Bb-Gb-Eb to end the opening section, imitating the frequent descending triadic arpeggios heard before (mm.1, 6, 8). If you don’t know the rest of the piece, treat yourself! The bass movement in the final measure in Example 1 (m.12) hints at the impending reharmonization of our melody. Rachmaninoff has through the use of pedal tones, set our ears up for a fresh harmonization—a standard Rachmaninoff device. 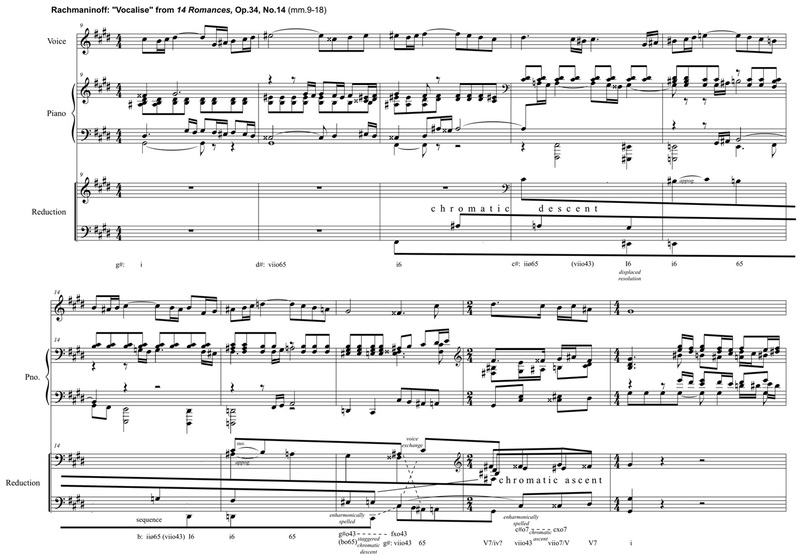 The second excerpt, shown in Example 3, is from Rachmaninoff’s “Vocalise,” the final song from the Opus 34 set of Romances. “Vocalise” was singled out by Russian conductor-pianist Vladimir Ashkenazy, who studied at the Moscow Conservatory as Rachmaninoff did, as being the one piece that sums of Rachmaninoff, the one piece that captures the essence of his oeuvre. 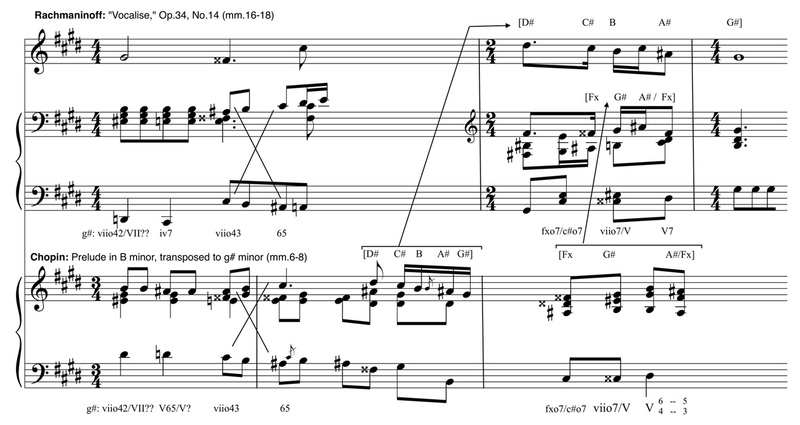 The reduction in Example 3 shows the proliferation once again of descending chromatic voice-leading. Listen to the languishing expressive effect of these descents, followed by the reversal ascension at the structural moment of cadence in bar 17. The effect is one of deflation and the short ascent leading into the cadence does very little to offer hope. This passage is from the middle of the piece and is developmental in nature. This may explain the multiple keys in the roman numeral analysis. Apparent chords proliferate to such an extent that any tonal grounding is lost until the cadential ascent. Rachmaninoff follows a pattern here: Major triads become minor triads which in turn become diminished triads which are then reinterpreted into new keys. 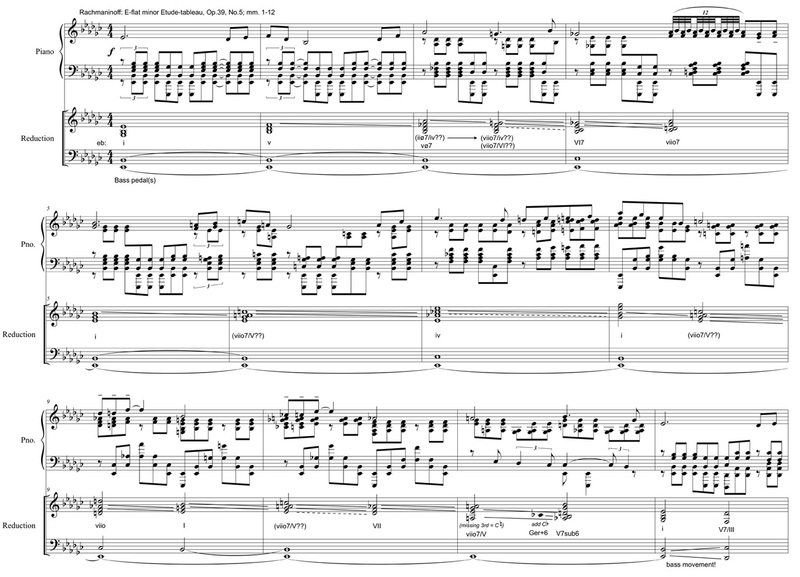 Beginning in measure 5, after two statements of the cello-like melody that begin with an arpeggio, Chopin embellishes. After the third arpeggio, this time at the submediant chord of G major, the harmonic progression begins to deteriorate. Chopin begins introducing descending chromatic lines in the voice-leading which produce apparent chords, much like the Rachmaninoff “Vocalise” passage I had been looking at. Surely this was a coincidence. Surely there are many dozens of Romantic pieces that use descending chromaticism which result in apparent harmonies. Then I noticed that Chopin, like Rachmaninoff, turns the descents around to a chromatic ascent just before the structural cadence. I began to think that perhaps Rachmaninoff had, whether consciously or not, been influenced by Chopin whose music he no doubt played as a pianist in training. The closer I looked at these two passages, the more things jumped out. I noticed that in both cases, when the passages arrives at the spot where the apparent chords stop—the spot where tonal grounding begins to be re-introduced—we hear a fully-diminished seventh chord. Not only that, but we hear the same diminished seventh chord, though spelled differently (fxo7 and a#o7), and more specifically, they were both viio43 in the ensuing key. Furthermore, the same voice-exchange occurs at these moments in both passages moving from a 43 inversion to a 65 bass position. In both cases, we hear a Re-to-Fa movement in the upper voice and a Fa-to-Re movement in the bass. Lastly, after this voice-exchange, both passages make their way to a Fa-Fi-Sol bass line with Fi being harmonized with a viio7/V. The bass lines map on to each other: D-C#-B-A#…G…C-Cx-D. 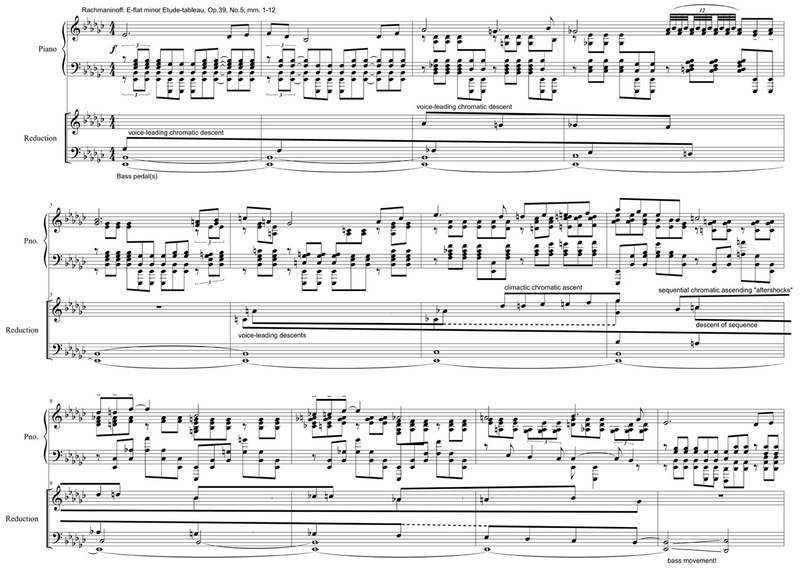 The upper voices’ of the Rachmaninoff also map onto the Chopin, though in a less straightforward way: B-A#-B-C#-D#… then the soprano line follows the Chopin sixteenth note figure in delayed fashion (D#-C#-B-A#-G#) while Rachmaninoff’s piano accompaniment maps onto the remaining eighths of Chopin’s measure 8 (Fx-G#-Fx). Notice, too, the other similiarities in the right hand parts of both pieces: E# diminished root position chord moving to a Fx fully-diminished in 3rd inversion. Then later the Fx dimished chord reappearing, with Chopin spelling the E as a Dx (Fx in the original B minor), then to a Cx diminished chord, with Rachmaninoff moving the E# to the left hand. This entry was posted in Uncategorized and tagged analysis, chopin, comparison, etude, music theory, prelude, rachmaninoff, vocalise. Bookmark the permalink. Wow! thanks for shear most important music informetation on your blog.Thanks for such a great blog.I am thoroughly surprised after reading your article. In fact I have experienced a condition something like this but I am just not able to tell you how better I feel after reading this.